If you have a goal to stop binge eating in 2018, I want to give you some advice that I hope will help you keep that resolution. 1.) Prioritize stopping binge eating. 2.) Disconnect stopping binge eating from your other resolutions. Let’s talk first about prioritizing your goal of ending the binge eating habit. Of the unhealthy eating habits you may have (we all have some! ), binge eating is probably creating the most pain in your life, and it’s the biggest factor holding you back from pursuing other goals or simply being more at peace. With that in mind, I would suggest setting aside your other eating-and-weight-related goals and keeping your focus on stopping the binges. This helps you avoid putting too much pressure on yourself to eat exactly “right,” and helps you avoid judging your eating too much or falling into an all-or-nothing mindset. If stopping binge eating is your top priority, then if you eat unhealthy, you can still be excited that you did not binge. If you overeat, instead of being upset with yourself, you can be proud that you did not follow your overeating with a binge. If you find yourself grazing when you are upset, you can praise yourself for not going into a binge during or after the grazing. And if your weight does not change in the way you want it to, it does not change your commitment to walk away from your harmful binge eating habit. Prioritizing stopping binge eating also means committing not to diet. If you’ve been following my blog and podcast, you know that restricting your food intake is a way to end up binge eating. Two of my recent podcasts focused on helping you avoid restrictive dieting in the New Year (and always!). Here are the links to listen: Episode 30: No Resolutions to Diet and Episode 33: Challenging Your Motivations to Diet. You might have some anxiety about making “stopping binge eating” your most important resolution, because you may be thinking…”What if I do binge? Does that mean I’ve failed at my top priority?” Absolutely not! Acting on an urge to binge does not mean that ending the habit is suddenly less important to you, and it certainly doesn’t mean you should give up. Because quitting is your top priority, you are in great position to learn from what happened, and move forward. You can look at what thoughts led you to follow the urge, decide what you will do differently next time, and commit to continuing to prioritize your goal of quitting. To illustrate this, I want you to imagine that your priority is to learn to play guitar, and realize that you would not quit if you played some wrong notes. The process of learning is your priority. Because your goal is important to you, you can seek support where you need it, and make adjustments as you see fit – until you are binge-free. 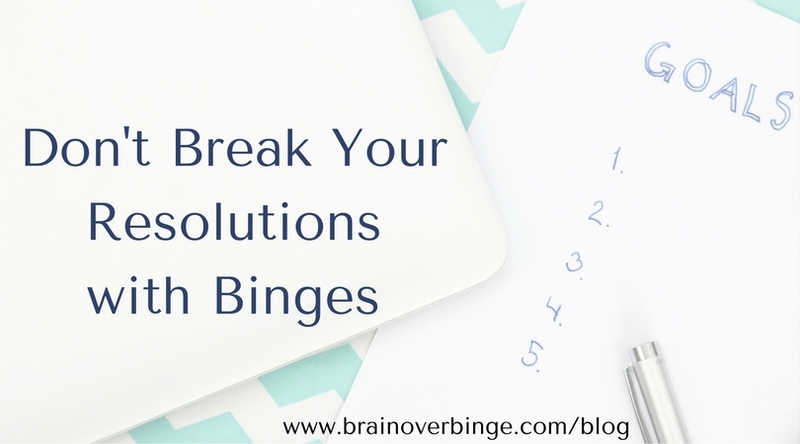 I named this post “Don’t Break Your Resolutions with Binges” for a couple reasons – one of them is to help you see that if you do break your resolution with a binge, that doesn’t give you a reason to keep repeating the destructive behavior. A binge does not need to turn into binges. When I was bulimic, my response to a binge was often, “well, now all is lost, so I might as well keep going,” and I’d end up binge eating for days at a time. I know this experience is common; but when stopping binge eating becomes your top priority, you can minimize the impact of any slips that you do have. For a podcast about getting back on track after a binge, listen to Episode 17: What if You Binge During Recovery? The other reason for this post’s title has to do with my second piece of advice for stopping binge eating in 2018, which is to disconnect stopping binge eating from your other resolutions. As much as I can tell you to put aside those goals for now, I know that they may still be in the back of your mind. Even if you plan to work on those goals in the healthiest, least-restrictive way possible, and you are committed to eating adequately, those other goals can still become connected in an unhealthy way to your goal of stopping binge eating (and therefore interfere with your goal of stopping binge eating). What tends to happen is this: You break your other eating resolutions (as most people do sometime in January), and then you have thoughts saying, “you’ve failed, so you might as well binge.” So, instead of just breaking your other resolutions, you break those resolutions with binges. Maybe you’ve experienced this before, but let’s say you resolve to avoid gluten, and then the first time you eat some bread, you think something like this: “See, this is evidence that you have no self-control, so you might as well give up, binge, and start over tomorrow.” Then the next time you eat gluten, this cycle repeats. Or, let’s say you resolve to eat only when you are hungry, and then the first time you decide to have dessert after an already satisfying meal, you feel that “all is already lost” and that “there is no reason to dismiss urges to binge”. Then, the next time you eat when you aren’t hungry, you do the same thing, so that you end up frequently breaking your resolutions with binges. But, what if you simply broke your healthy-eating resolutions, and stopped there? What if you ate gluten, but still stayed committed to avoiding binges? What if you always dismissed binge urges after eating when you weren’t hungry? What if you didn’t lose a single pound in 2018, and never used that as a reason to binge? Breaking your resolutions would cause so much less damage, and in many cases, absolutely no damage, and you’d stay on a path to a better life – even with all of your imperfections. Think of the millions of people who simply break their resolutions and don’t go on to do something more harmful afterward. It’s difficult to give up a food or food group altogether, or to follow exact parameters for eating, which is why not many people manage to consistently eat in an ideal way. Plus, eating in an “ideal” way is different for each person, so you don’t want to create a scenario where your ability to binge or not binge depends on your ability to follow or not follow difficult food rules – rules that may not even be right for you personally! If any of your friends told you that they broke their New Year’s resolution to eat healthy or to avoid a certain food, would you tell them that “all is lost” and they “might as well binge”? Of course not! But, somehow binge eaters tend to believe this same logic when it comes from their own thoughts. These type of thoughts are neurological junk from the lower brain – the part of your brain that is trying to maintain your binge eating habit. If you can learn to dismiss these binge-encouraging thoughts, you are well on your way to erasing the habit. I’m not saying you can never decide to make healthy changes in the way you eat; but, I am saying that whether or not you are “successful,” you never have to binge. And that is a huge success! It’s the same with any type of resolution, even if it’s completely unrelated to eating. I think it’s wonderful to create goals for yourself in other parts of your life, so that you can turn your focus away from food and weight obsessions. However, even if you don’t measure up to the vision you have for yourself in 2018, and even if you never accomplish what you intend to in this coming year, you never have to follow thoughts that say “you might as well binge,” and you can become binge-free. I wish you all the best in 2018! Thanks for continuing to read the blog, listen to the podcast, and receive the newsletter! If you are here for the first time, you can get my free eBook, “The Brain over Binge Basics,” here (which will also subscribe you to the monthly newsletter that includes my most recent blog post, podcast episodes, and other recovery resources all in one place, delivered to your inbox each month). Also, stay tuned for news about the next Brain over Binge 8-Week Group Course, and remember that the Independent Study Course is always an option if you want to go through the course at your own pace.